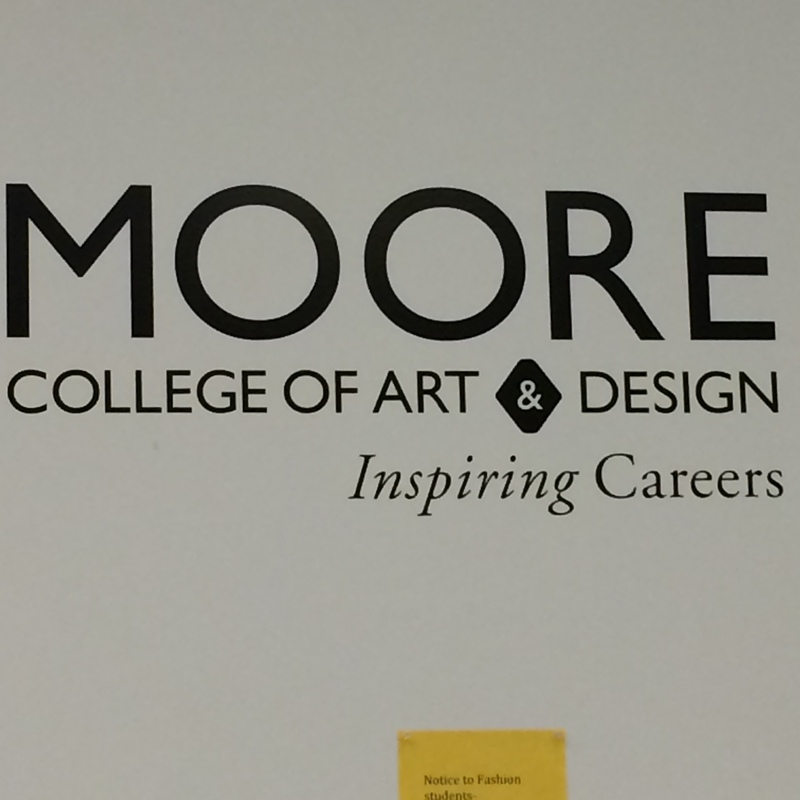 Last night was my first class at Moore College of Art & Design. 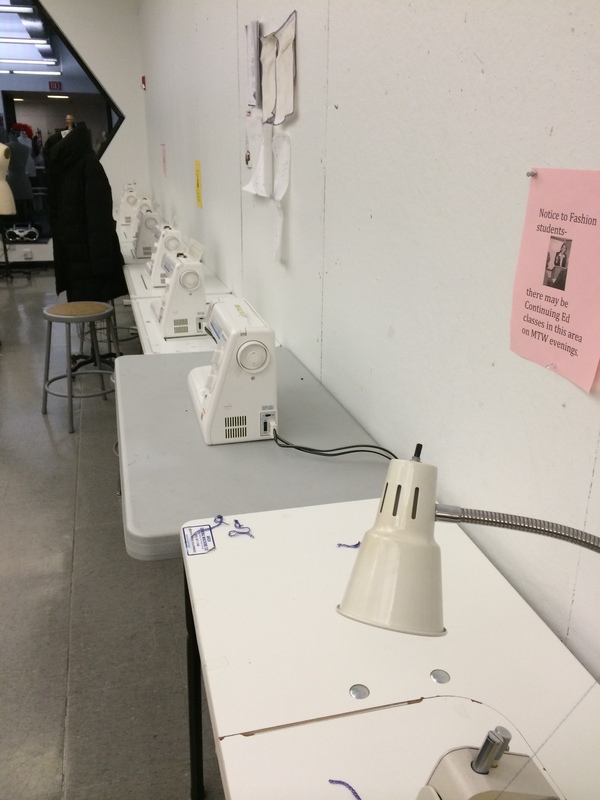 I’m taking fashion studies in the certificate program to gain a solid knowledge base about making my own apparel. Although I’m not looking for a career change, I am looking to enrich myself with a wonderful, lifelong skill that I can enjoy for myself and share with others. A little about myself, I’m a go-getter, a doer, a planner and all around git ‘er done chick. I love learning and I never think twice about taking a class, going to a seminar, buying a boor or networking with someone who knows more about something than I do. 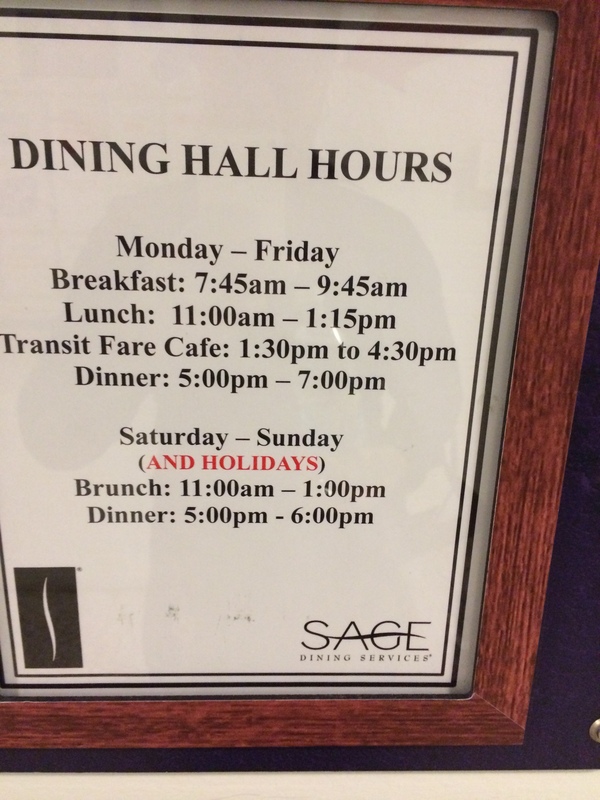 With that said, enrolling in the program was a no-brainer. I purchased my 1st sewing machine after following a few blogs, watching YouTube videos and having the desire to do more for myself regarding apparel (alter, fit, make) and accessories. I’ve made a few skirts, accessories, crafts and home décor items but I wanted more formal training that would help me step up my game and become a better sewer and eventually pattern maker. The instructor was good. She is a Moore alum and seems really eager to show us more about the sewing ABC’s. The syllabus outlined our semester and I immediate got excited! She said we’re making a stitch book! Why would that excite me you ask, I’m such a visual person and having a place for all of the stitches (machine and hand) as well as the various zipper install methods and button types is golden. I can’t wait to get started. The supply list is HUGE!!! However, I expected it to be. 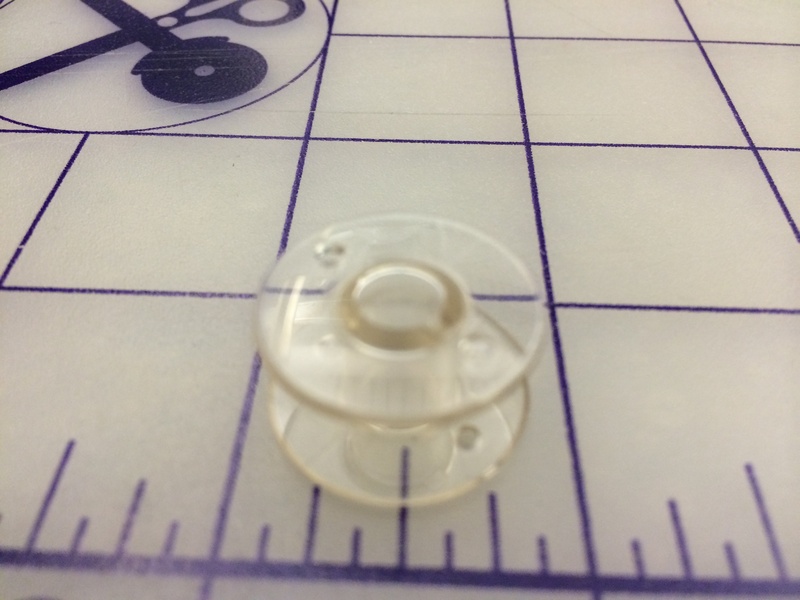 Sewing is a very NEEDY hobby and to make your time behind the machine enjoyable, you must have all the notions available at the start to get you through any project. I have most of the supplies, but a few are going to set me back. Pattern weights (gotta find a DIY that doesn’t include washers), notcher, dressmaker pins (they don’t want us using the pins with the ball on the end) and a few other things. 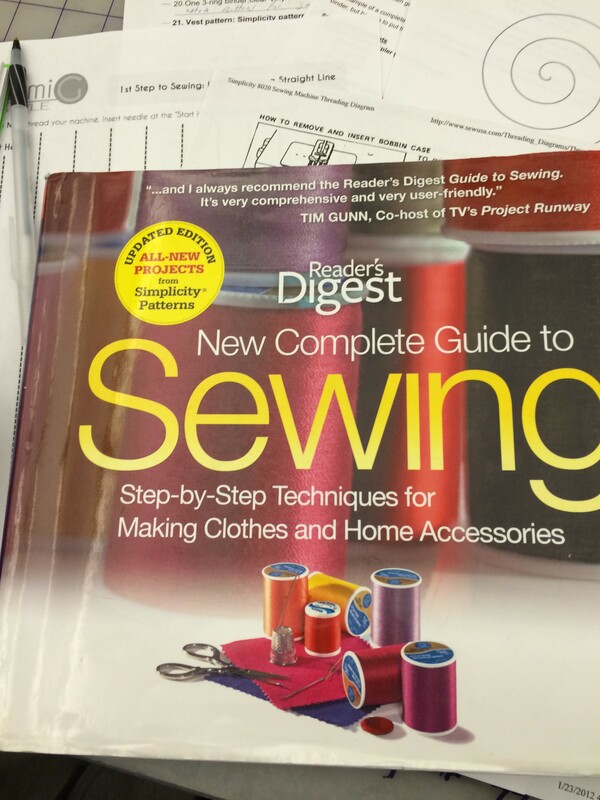 The required text is a book I’d gotten from the library some time ago and had it in my Amazon wish list called, The New Complete Guide to Sewing. It’s a great book, filled with wonderful photos. It’ll definitely be my go-to sewing source. The instructor demonstrated how to wind a bobbin and thread a machine. Some folks in class don’t even own sewing machines, so this was a good tutorial for them and for the first in-class project. I was a bit surprised she didn’t give all the proper names of the machine parts like ‘take up lever’, ‘feed dogs’, or ‘throat plate’. I find that knowing what something is called gives you an upper hand when speaking or reading about something elsewhere, you’ll know what it means and won’t have to guess. 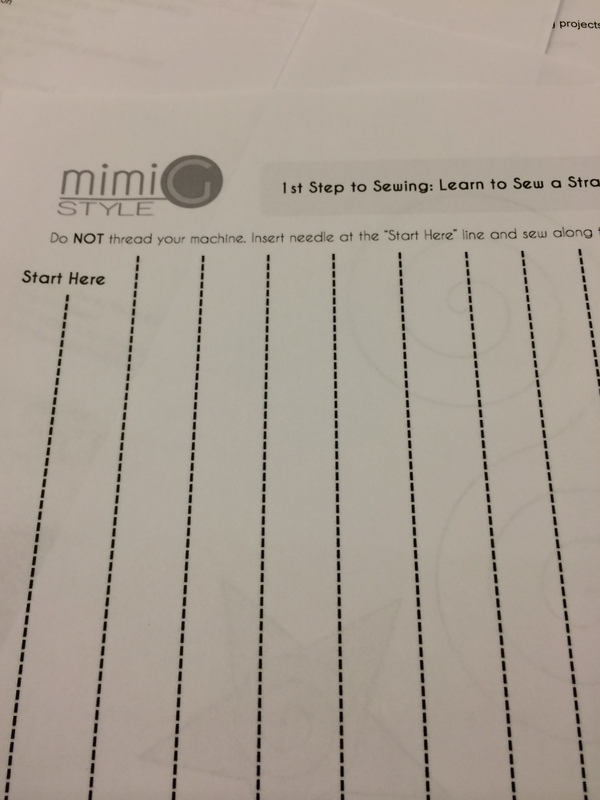 After that, we practiced sewing in a straight line on paper using the pdf from Mimi G as well as practice sewing on a curve. That was by far the most insane thing I’ve done yet with a machine. She didn’t give much instruction on how to do either short of keep you eye on the guide and control where you want the stitch (paraphrasing here), however, she was going around helping folks get their bobbins wound and such. My attempt at sewing on a very uber tight curve was a disaster (but I learned from it). Overall, a good first class and I’m looking forward to shopping this weekend and getting underway. A girl needs to know when to get her coffee. 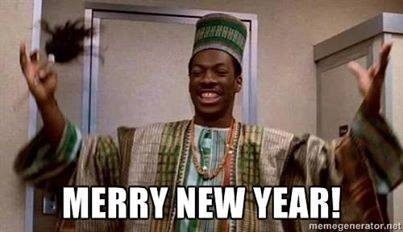 Wishing everyone a Merry New Year! 2013 for me was filled with so much love and fun and plenty friends, but it was also filled with tears, surgeries and pain. As with the end of every year, we all tend to look back and reflect on all that we’ve experienced. Some people had additions to their families, some lost dear family members and everyone made mistakes and learned a little bit more about themselves. I wish to grow spiritually and learn more about my faith. Spend quality time with my youngest son before he’s off to college. Go on vacation with my husband to a warm climate. Get healthy & get back to weight training. I don’t make resolutions anymore, they really don’t work, I just focus on little things that don’t require a total 180 degree change in who I am, rather, just small gestures that make me a better all around person. I hope you have a magnificent year that is filled with all the love you can stand.